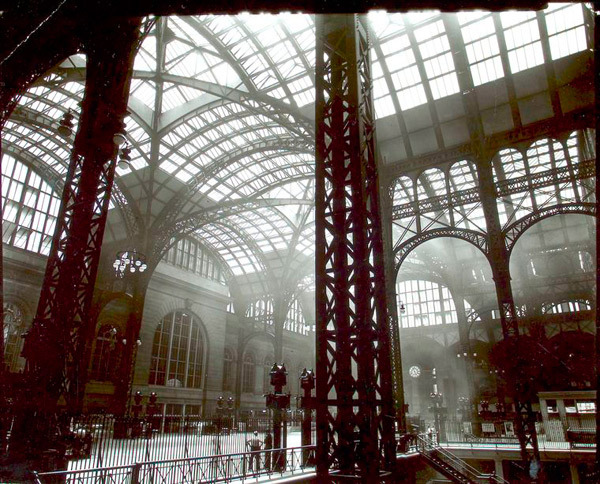 Penn Station, Interior, Manhattan (1936) by Berenice Abbott. Source: Changing New York / Berenice Abbott. Repository: The New York Public Library. Photography Collection, Miriam and Ira D. Wallach Division of Art, Prints and Photographs. Berenice Abbott was a lesbian before this was acceptable. She was a closeted lesbian all her life. In a letter to Kaucyila Brooke, June 3 1985 she writes, ‘I am a photographer, not a lesbian’. She never acknowledged her personal relationship with Jane Heath or any other women. Berenice (July 17, 1898 – December 9, 1991), born in Ohio moved to Paris in 1921 where she apprenticed to the famous artist-photographer Man Ray. In 1926 opened her own studio, where she made portraits of the intelligentsia: Jean Cocteau, James Joyce, André Gide, Janet Flanner and Djuna Barnes among them. In 1929 when she returned to New York and began a five-year endeavor called “Changing New York,” subsidised by the Federal Art Project, created by F.D.R.’s New Deal, concentrating on buildings rather than on people. 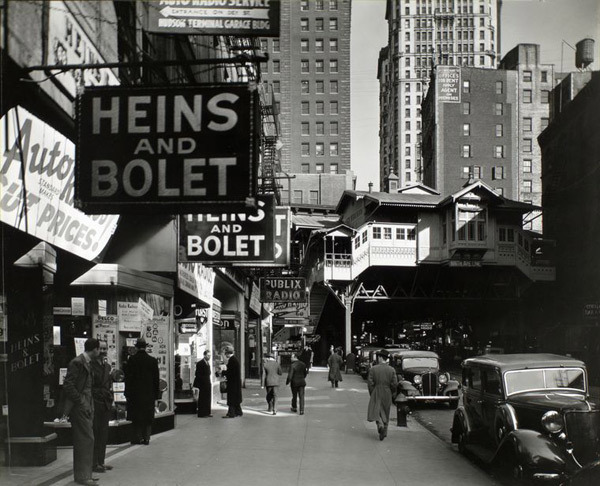 Photograph of Radio Row, looking east along Cortlandt Street towards Greenwhich Street, by Berenice Abbott (1898-1991) from her “Changing New York” Works Progress Administration/ Federal Art Project. 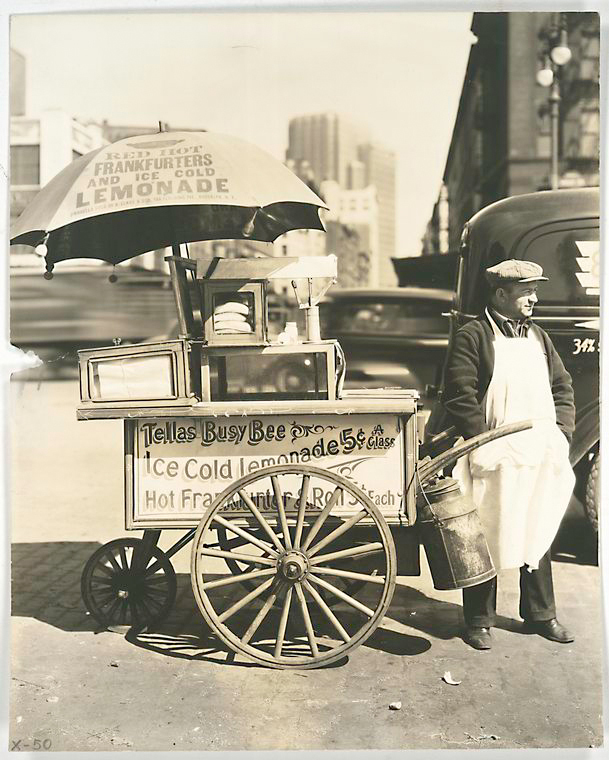 Hot Dog Stand, West St. and North Moore, Manhattan (1936). Photo by Berenice Abbott. 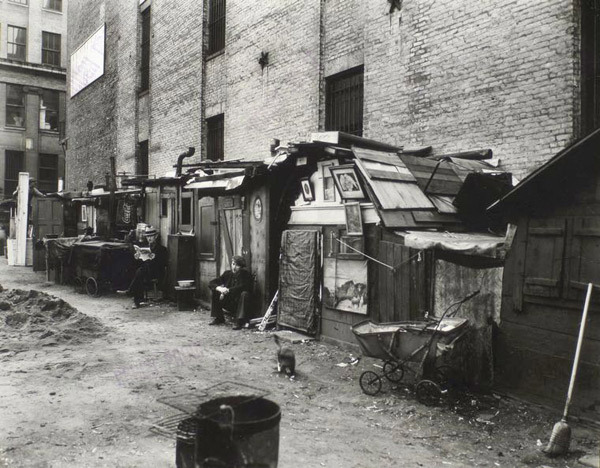 Huts and unemployed, West Houston and Mercer St., Manhattan (1935) by Berenice Abbott.